As we celebrate our remarkable 25th anniversary, we are getting back to our roots and the original purpose for which we were formed – by extending our work to couples as well as individuals. Family breakdown is all too common these days and has a huge impact on the couple themselves, any children (including grown up children) and wider family members. It can lead to lower living standards and enormous stress and heartache. Is your relationship under pressure because of health problems, caring responsibilities, financial worries, loss of employment or bereavement? Or are you caught in a pattern of destructive arguments and behaviour, leaving you feeling hurt, bewildered, frightened and helpless, wondering what has happened and whether there could ever be a positive way forward? Or is an emotional distance emerging, leaving you feeling isolated and unloved, or has a crisis been precipitated by the discovery of an affair? With the attentive involvement of a skilled practitioner in a safe and neutral space, you will be helped to unpick what is going wrong and find new ways of relating to one another to transform and heal your relationship. But couple counselling isn’t always about keeping families together. Whilst counselling might not always ‘save’ the marriage or partnership, with willingness on both sides it can promote better understanding and awareness of what’s happening and why. This can ease the transition to separate lives, particularly important where children are involved. You & Yours Counselling is opening its doors to couples in August. 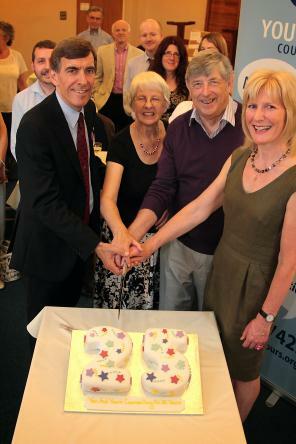 Photo: Adam Schofield, Cheshire Photography Co.
David Rutley MP joined volunteers and members of You and Yours Counselling in Poynton to celebrate the organisation’s 25th anniversary. You & Yours Counselling was launched in 1989 with the support of local churches to deal with the impact of family breakdown on people’s mental and emotional well-being. Since then, You & Yours Counselling has evolved into a general counselling service and seen many hundreds of individuals in distress over the years. It has also supported the professional development of dozens of trainee counsellors and supervisors. The Macclesfield MP addressed the audience at the well-attended celebration. He praised You and Yours Counselling for the work they have done in supporting the local community and the positive impact the service has had on the lives of so many people. After his speech, David was joined by volunteers and founding members as he cut the anniversary cake. For more information telephone the answerphone service on 01625 874225 to make an initial appointment.